From a beer mecca in upstate New York to an art-and-food-lover’s destination in West Texas, these five burgs represent our favorite little (under 5,000 people) food towns in the country. Bonus: A tiny, food-obsessed hamlet of only 90 people. Visitors come to this idyllic town to visit the National Baseball Hall of Fame, and perhaps to stay for a gin and tonic on the porch of the lakefront Otesaga resort. But in the past few years, the food has become its own draw. Local chefs shop at the year-round farmers’ market, and their restaurants serve the local beer, which (happily) comes from the town’s nationally revered Ommegang Brewery.—Gina Hamadey Photo © Jennifer May. Chef Alex Webster is the former manager at New York City’s famed Dean & DeLuca market, and he brings the same level of obsessive attention to detail to his terrific Cooperstown restaurant: His superlative BAT sandwich uses smoked bacon, fresh arugula and roasted tomato. This is the kind of place where customers come for a quick lunch and decide to return for dinner to try more elegant dishes, like roast duck and apple tarte Tatin. 149 Main St.; alexandika.com. Photo © Jennifer May. At this bucolic, Belgian-style brewery, the enthusiastic staff give hourly tours that culminate in a beer-tasting session. The café, which opened last spring, serves Ommegang’s delicious brews and imported Belgian beers (like the hoppy Houblan Chouffe). The food is very ale-friendly: crêpes filled with duck confit or bratwurst and frites with inventive dipping sauces like chile aioli and beer-and-cumin ketchup. 656 County Hwy. 33; ommegang.com. Photo © Jennifer May. Alex & Ika chef Alex Webster opened this new restaurant 15 miles from Cooperstown, but his homemade chips alone are worth the drive. The menu covers a broad range of Latin and Caribbean dishes (like Jamaican goat-curry fajitas) in addition to light, fresh takes on Mexican burritos, tacos and mole sauce. “We don’t smother everything in cheese,” says Webster. 11 Main St., Cherry Valley; 607-264-9500. Photo © Jennifer May. This year-old, family-run Italian restaurant has the feel of a place that has been around forever—locals celebrate birthdays and anniversaries here, and the owner’s mother, Giovanna Vezza, makes fresh gnocchi and fettuccine daily. The Neapolitan pizzas, with toppings like prosciutto, peppers and an egg, come out of a superhot, shiny silver wood-burning oven, custom-built in Naples. 5438 State Hwy. 28; boccaosteria.com. First came the artists, then the food scene followed: This sleepy town outside Oxford has recently seen an upswell of young creative types and entrepreneurs. Thanks to low storefront rents, they’ve opened art galleries, restaurants and the town’s hub—an old-fashioned grocery store selling locally ground grits, fresh ice cream and grass-fed beef.—Chelsea Morse Photo © Blair McElroy. Chef and co-owner Justin Showah has been cooking seafood at his father’s renowned Jackson restaurant, the original Crawdad Hole, since he was 15. At his new roadside seafood shack, guests come for Showah’s own feasts: boiled crawfish and shrimp served by the pound in a former gas station transformed into a laid-back room with checkered tablecloths. 129 S. Main St.; 662-816-4006. This market in a renovated 140-year-old building sells ice cream made from lemon pound cake, freshly baked buttermilk chess pies and impeccable local produce for prices that owner Alexe van Beuren calls “cheaper than Wal-Mart.” 301 N. Main St.; btcgrocery.com. Every Thursday night, until it gets too cold, Fiddlin’ Rooster Farm opens its barn doors for acoustic performances by local musicians—and dessert. Little Red Hen Bakery provides “Grammaw’s” five-layer Chocolate Cake 5.0, pistachio cake and oatmeal-chocolate-cranberry cookies. 393 Country Rd. 102; fiddlinroosterfarm.com. This busy barbecue trailer (parked on the corner of Main Street and Panola) will become a brick-and-mortar restaurant by the end of the year. In addition to the best-selling pulled pork, DeMarc White will serve burgers and four varieties of his super-popular smoked chicken wings. 111 N. Main St. This remote contemporary-art mecca has become an unlikely eating oasis, with food trucks doling out eclectic dishes (falafels and grilled cheese) and classic Southern barbecue joints shouldering up alongside vegan cafés. The restaurant community is so close-knit, owners coordinate their wine lists to keep their offerings diverse.—M. Elizabeth Sheldon Photo © Adam Bork. This Mediterranean lunch truck, which travels in tandem with a school bus converted into a mobile dining room, has become a favorite for its fattoush salad and “Marfalafels,” traditional falafel fillings stuffed inside a flour tortilla. Food Shark expanded in 2010 with a bus that sells grilled cheese on the weekends, and plans are in the works to open a permanent location by the end of this year. foodsharkmarfa.com. These super-thin-crust pizzas, topped with ingredients like local tomatoes and fresh chorizo, are a welcome West Texas anomaly. After closing in the summer for a face-lift, the restaurant recently reopened with a new menu, including sandwiches on house-made focaccia. 100 E. San Antonio St.; pizzafoundation.com. This family-run café and florist serves delicious quesadillas and vegetarian salads, along with freshly baked muffins and lemon meringue pies made from a classic family recipe. (The owner’s grandmother ran Marfa’s famed Thunderbird Café for years.) 1613 W. San Antonio St.; 432-729-4282. Tom Rapp and Toshifumi Sakihara met at now-closed cult-favorite Restaurant Etats-Unis in New York City, before decamping to West Texas in 2008. They recently revamped the menu (chilaquiles is a new dish) and added a cocktail bar, overseen by former Gourmet magazine beverage editor Jimmy Rodewald. 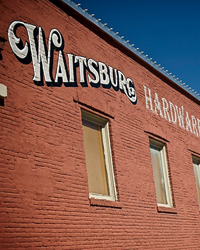 107 W. San Antonio St.; cochinealmarfa.com. You might expect Waitsburg, 25 minutes from Walla Walla wine country, to be made up of tasting rooms and wine bars. Instead, the three-block town has a distinctly cool feel, with art galleries, great coffee shops and amazing new cocktail bars and beer joints.—Gina Hamadey Photo © David L. Reamer. At this homey cocktail bar, big-time Seattle mixologist Jim German makes classic and creative cocktails, like Manhattans and rum-spiked chai. 119 Main St.; jimgermanbar.com. Charles Smith, F&W Winemaker of the Year 2009, owns this jukebox joint, so the house wine is his own, from Walla Walla’s K Vinters. The bar menu includes four kinds of hot dogs. 128 Main St.; theanchorbar.net. The coffee at Coppei is a cut above, made exclusively with El Salvador beans from Walla Walla Roastery, which also trains the baristas. 137 Main St.; 509-524-8184. At this new Champagne-and-chocolate store, Karen Gregutt selects the artisan chocolate while her husband, Seattle Times wine adviser Paul Gregutt, chooses the eclectic mix of sparkling wines. 208 Main St.; 206-409-8399. La Monarca taco trucks are Walla Walla institutions. Last year, the couple who runs them opened this restaurant, where many of their terrific tacos and burritos (chicken, carne asada) come with griddled Walla Walla sweet onions. 206 Main St.; 509-337-6061. Until recently, people came to this Sonoma County town for hiking and rafting. But Crista Luedtke opened Boon Hotel + Spa in 2008, followed by a restaurant and market. Now, Guerneville is becoming a wine-country food hub.—Megan Krigbaum Photo © Kelly Puleio. At Crista Luedtke’s airy, modern restaurant, the tables are made from a felled redwood tree and the simple menu is meant to show off produce from her backyard garden and area farms. In the fall, regulars demand the return of her crispy pork belly with black-eyed peas and garlicky rainbow chard. The wine list features only bottles made in the Russian River Valley. 16248 Main Street; eatatboon.com. Photo © Kelly Puleio. Luedtke co-owns this superb epicurean market and wine bar, which opened a year ago. On Wednesday nights from October through May, chef Tricia Brown creates $25, three-course prix fixe dinners starring cool-weather comfort dishes, like green chile turkey meat loaf with mashed potatoes. 16228 Main St.; bigbottommarket.com. At her year-old wine bar, Leslie Bahr is committed to showcasing bottlings from some of the teeniest wineries in Sonoma County (like Zinfandel from Wild Hog and Pinots from Paul Mathew), most of which don’t have their own tasting rooms. Bahr serves small bites and pizza (she spent three months working on the thin-crust recipe alone), with toppings like caramelized onions, Humboldt Fog goat cheese and fresh thyme. 16230 Main St.; whitetailwinebar.com. At his exceptional Bar Crudo in San Francisco, chef Mike Selvera focuses on raw seafood. His upcoming Guerneville spot, opening in the next few months, is named after the rusting boats along the nearby coast and will specialize in oysters and fish stews. Besides local Russian River wines, Selvera will highlight beers from the region’s many craft breweries. 16222 Main St.; barcrudo.com. Photo courtesy of Royer’s Round Top Cafe.